Get it right - or get it done? You're standing among the pine trees in a team of 6-8 people. It's about 1.45 PM and until 3 hours ago you didn't know one another. 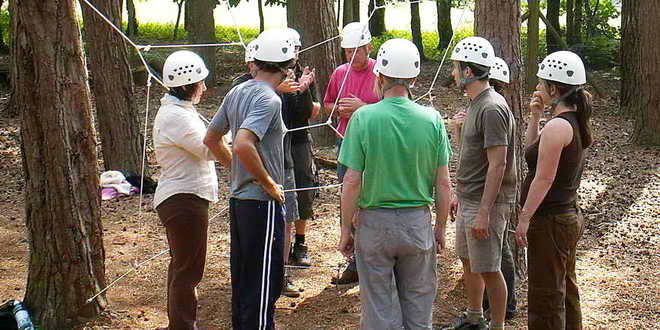 You're taking part in the Low Ropes challenge course, it's the first day of your NLP Core Skills and you and your team are about to do the Spider's Web Challenge. Higher holes mean one of the team may need to be lifted through and this will require at least three team members on each side of the web to safely lift the participant through. ... and so the list goes on. Lots of rules but no explanation of how to do it. Now it's up to your team to figure things out. Soon the team polarises into the careful analysers and the adventurous 'just do it' people and, as we usually discover later when we are doing the formal review of the session, they perceive each other quite differently. The analysers want to get it right and avoid mistakes - often without considering that it's really just a game and that making mistakes is no big deal! Nevertheless they tend to perceive the 'just do it!' people as impulsive, risky and foolhardy (just like they do in everyday working life). If the analysers get their way they will talk and talk and talk - occasionally to the point where the team can even run out of time for the activity. On the other hand the 'just do it!' people tend to find the analysers frustrating, over-cautious and too cerebral. And, if the discussion drags on for too long, they'll either become bossy and impatient - or completely disengage from the process, just like they do in those numerous and interminable work-place meetings! Yet if the 'just do it!' people get their head they can end up not being able to complete the activity because they haven't foreseen some of the difficulties that can arise. Which is the 'right way'? In the Spider's Web and subsequent Low Ropes activities it usually emerges that neither approach is the 'right' one, that there are risks and benefits to each, and that it is a matter of having the most appropriate approach for the task in hand - once again, just as in the world of everyday life. The idea is to discover which style represents your personal your Comfort Zone. And to recognise the benefits and drawbacks of style - both in how you approach projects and in how to communicate with people who have a different style to you. And to develop the less-strong side - which, for many of us, means developing our 'just do it!' side. People with the 'just do it!' approach learn-by-doing. In the Spider's Web the team that adopts this approach learns most. They'll have stretched themselves more, too. And, while they may not have successfully got everyone through the web, they will have learned a lot about each other, about their personal styles, about what works and what doesn't work in the Spiders Web, and about how teams can pull it together. We human beings are natural experimenters: after all, learning by doing and experimenting is how we learned to walk and talk. But at this early stage we were encouraged continually - even when we got it wrong. It was only a bit later, when we began school, that we learned that there were 'right' and 'wrong' answers and that taking the time to get things right is rewarded. This is when we discovered that were penalties for being impulsive, for not thoroughly thinking things through and for unconventional views or impulsive actions. Recognising the penalties involved in not 'getting it right', many of us developed strategies for playing safe - avoiding such penalties. One such strategy was to avoid being spontaneous, or impulsive, or just having a go. And a great way of doing this was to evaluate and plan and talk and talk. We learned that it is wiser and safer to talk and to think rather than have a go. Not everyone got conditioned in this way. There were lots of escapees who, for all sorts of reasons, did not fall into the risk-averse trap and determinedly did it their way. These 'learn by doing' people aren't as fixated on the absolutes of succeeding or failing. They see each unsuccessful attempt as another way to not do it next time. They are life's enthusiastic experimenters - they have more failures than the rest of us - and more successes. They do more. So they make more mistakes - many more. But in doing so they learn much more. And, because they haven't bought into the get-it-right-every-time attitude, they are continually extending their repertoire of skills. And developing their self belief and self confidence. Of course, it's not a matter of becoming a 'just do it!' person. That's a bit too simplistic for a complex world. It's a matter of having the flexibility to do what will work best at any stage in a situation - and recognising when to use which style. And for many of us this means we must first recognise our learned tendency to over-intellectualise rather than strike a balance between thinking with action. (1) Get into the habit of recognising the moment your school-conditioned imprint to 'get it right and avoid mistakes' is kicking in and taking over. Your aim is to move it from becoming an almost instinctive response to be a choice point. (2) Begin reframing, or giving a new meaning or significance to, 'mistakes'. Instead of seeing them as 'failures' see them as a means of developing skill, self confidence, and of moving more quickly towards success.